This is the third episode of my pandas tutorial series. In this one I’ll show you four data formatting methods that you might use a lot in data science projects. These are: merge, sort, reset_index and fillna! Of course, there are many others, and at the end of the article, I’ll link to a pandas cheat sheet where you can find every function and method you could ever need. Okay! Let’s get started! In real life data projects, we usually don’t store all the data in one big data table. We store it in a few smaller ones instead. There are many reasons behind this; by using multiple data tables, it’s easier to manage your data, it’s easier to avoid redundancy, you can save some disk space, you can query the smaller tables faster, etc. The point is that it’s quite usual that during your analysis you have to pull your data from two or more different tables. The solution for that is called merge. 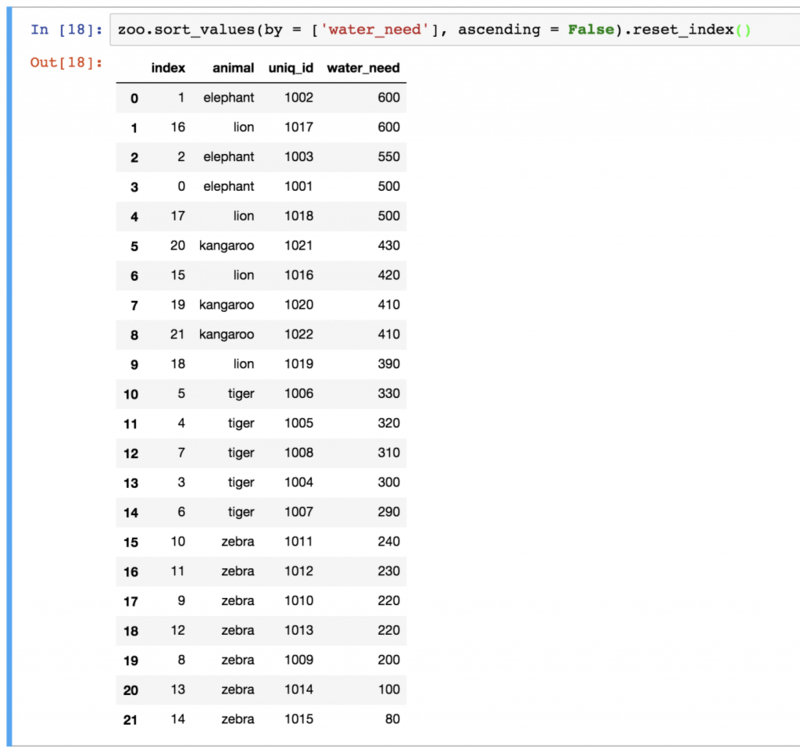 Note: Although it’s called merge in pandas, it’s almost the same as SQL’s JOIN method. Let me show you an example! 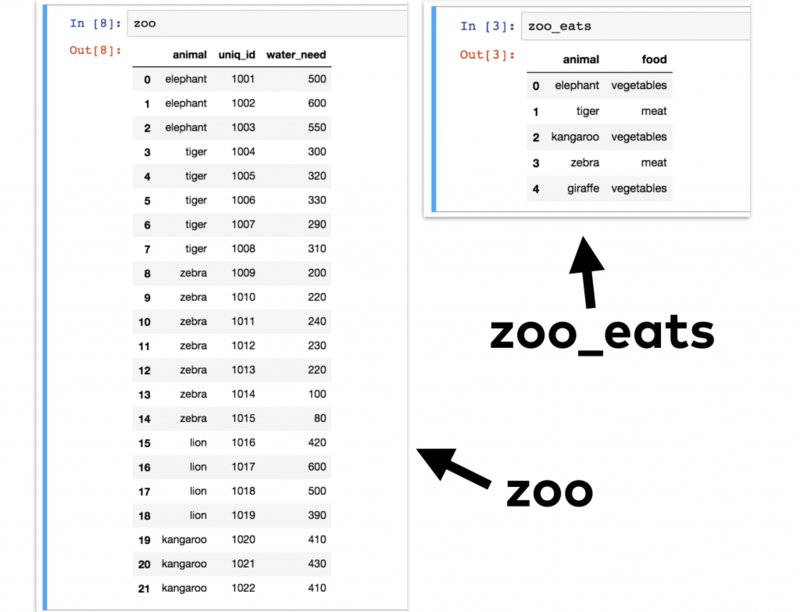 Let’s take our zoo dataframe (from our previous tutorials) in which we have all our animals… and let’s say that we have another dataframe, zoo_eats, that contains information about the food requirements for each species. 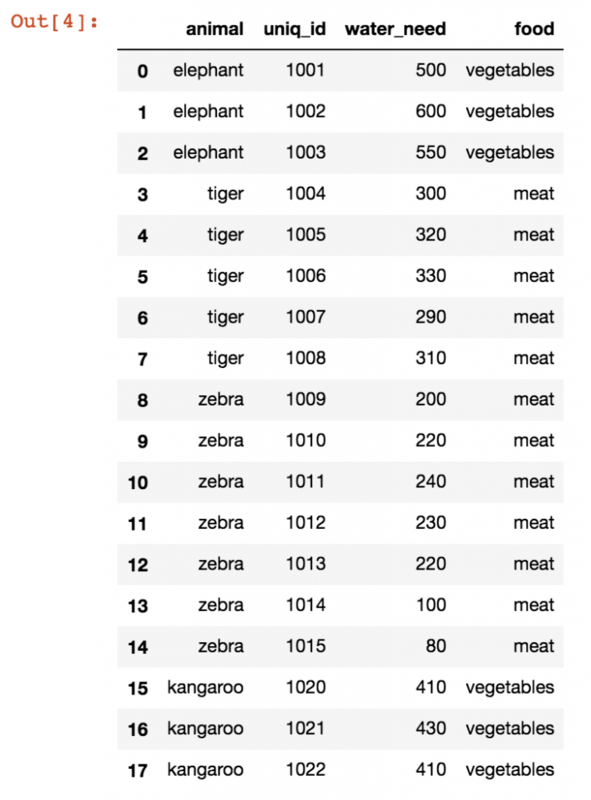 In this table, it’s finally possible to analyze, for instance, how many animals in our zoo eat meat or vegetables. How did I do the merge? 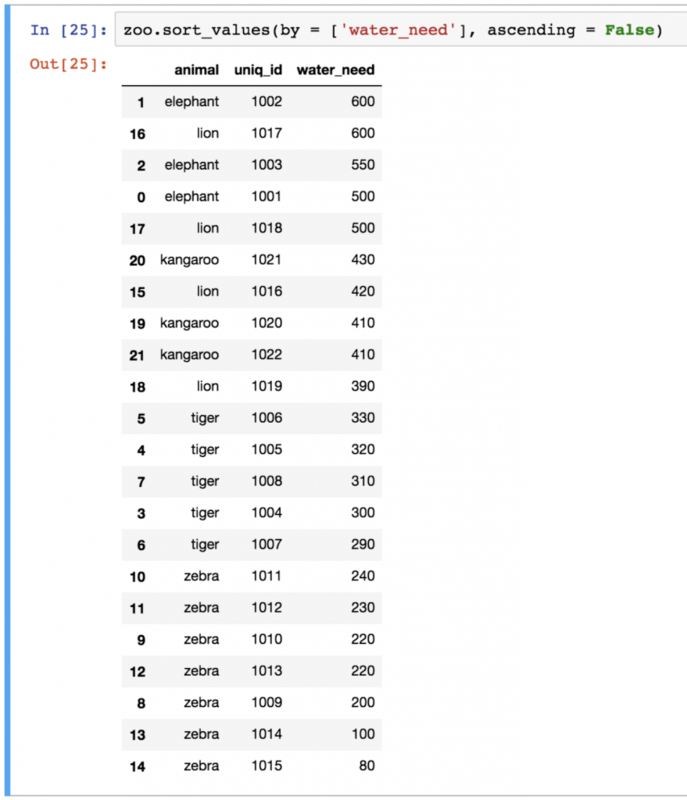 And there is your zoo_eats dataframe! Pandas Merge… But how? Inner, outer, left or right? As you can see, the basic merge method is pretty simple. Sometimes you have to add a few extra parameters though. 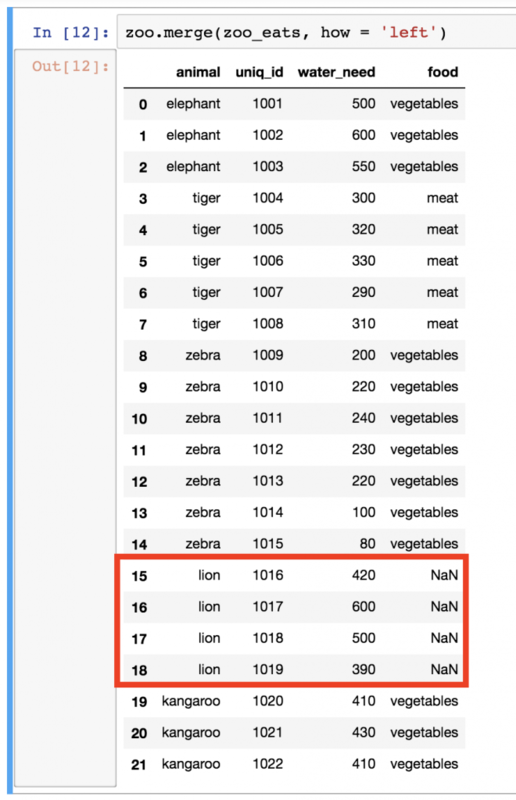 One of the most important questions is how you want to merge these tables. In SQL, we learned that there are different JOIN types. The theory is exactly the same for pandas merge. 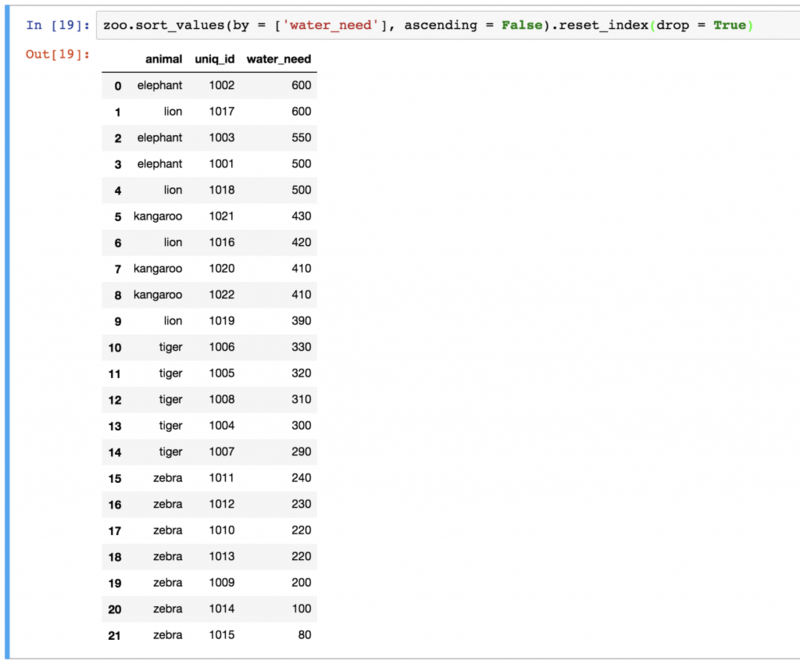 When you do an INNER JOIN (that’s the default both in SQL and pandas), you merge only those values that are found in both tables. On the other hand, when you do the OUTER JOIN, it merges all values, even if you can find some of them in only one of the tables. See? 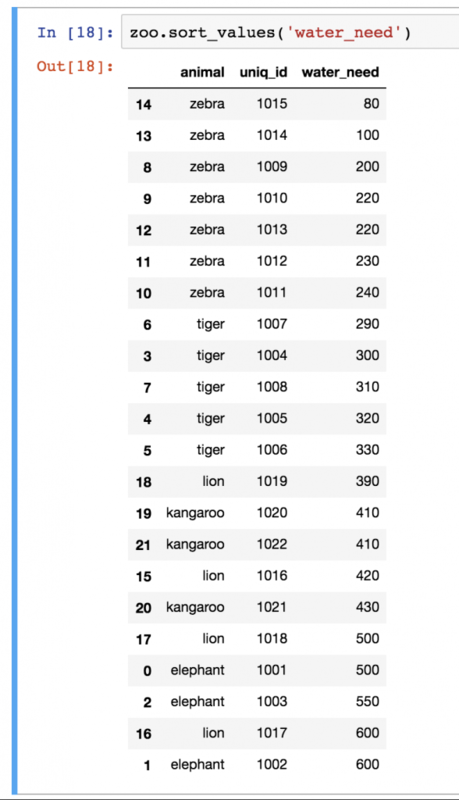 Lions came back, the giraffe came back… The only thing is that we have empty (NaN) values in those columns where we didn’t get information from the other table. 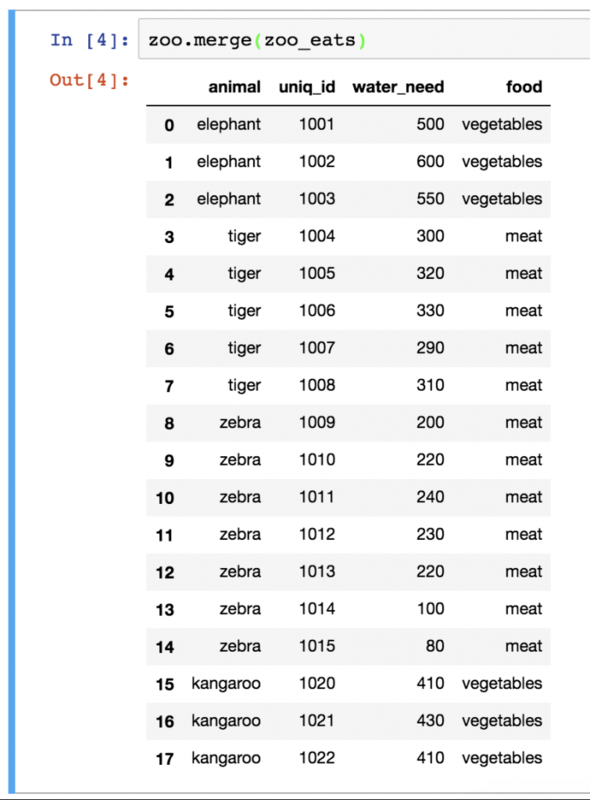 In my opinion, in this specific case, it would make more sense to keep lions in the table but not the giraffes… With that, we could see all the animals in our zoo and we would have three food categories: vegetables, meat and NaN (which is basically “no information”). Keeping the giraffe line would be misleading and irrelevant since we don’t have any giraffes in our zoo anyway. That’s when merging with a how = 'left' parameter becomes handy! 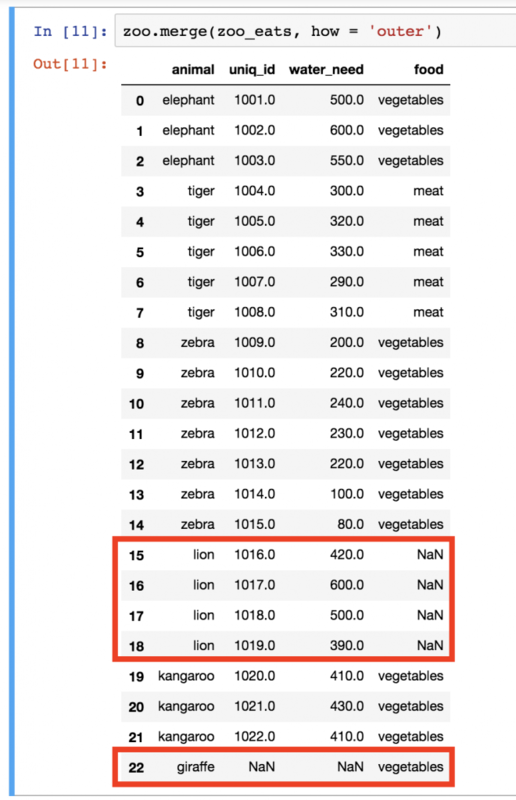 Everything you do need, and nothing you don’t… The how = 'left' parameter brought all the values from the left table (zoo) but brought only those values from the right table (zoo_eats) that we have in the left one, too. Cool! Note: a common question I get is “What’s the “safest” way of merging? Should you go with inner, outer, left or right, as a best practice?” My answer is: there is no categorical answer for this question. 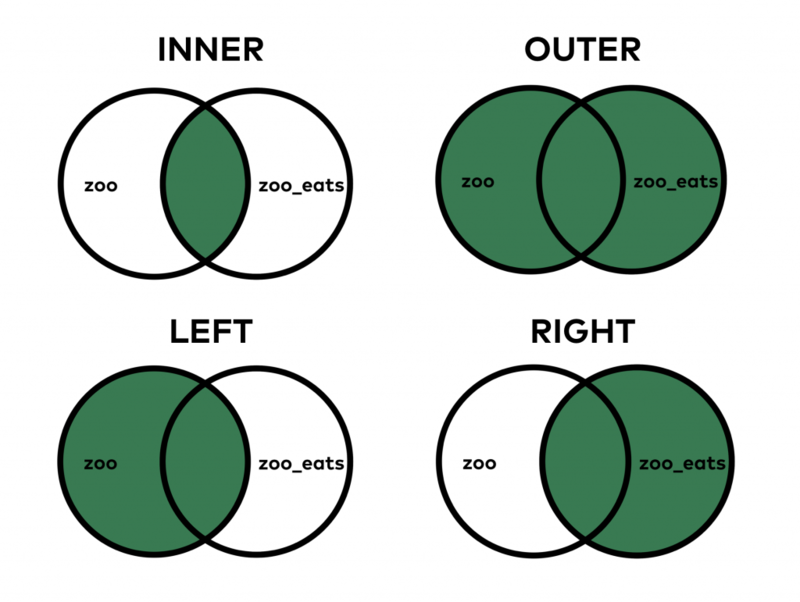 While inner is the default merge type in pandas, whether you should go with that, or change to outer, left or right, really depends on the task itself. Pandas Merge. On which column? 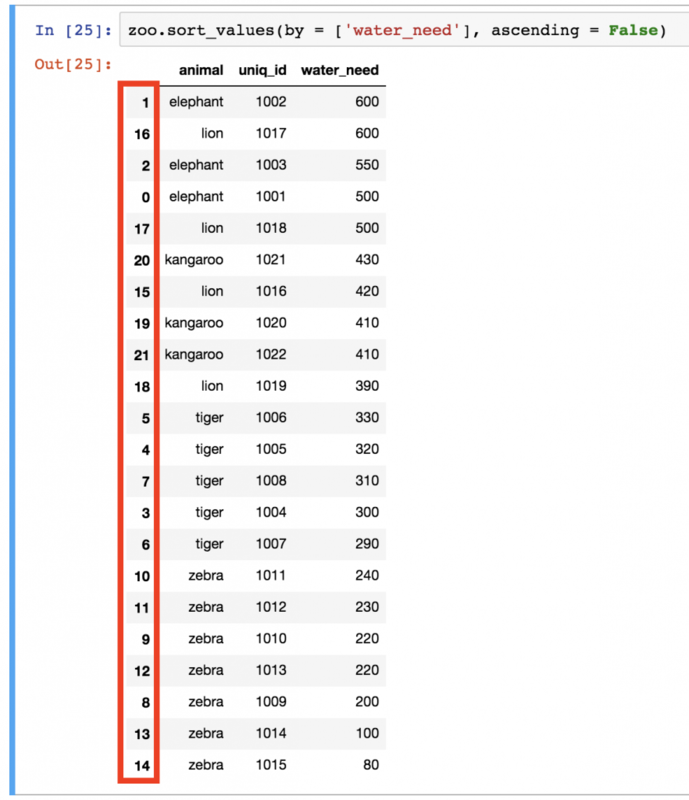 For doing the merge, pandas needs the key-columns you want to base the merge on (in our case it was the animal column in both tables). If you are not so lucky that pandas automatically recognizes these key-columns, you have to help it by providing the column names. That’s what the left_on and right_on parameters are for! Note: again, in the previous examples pandas automatically found the key-columns anyway… but there are many cases when it doesn’t. So keep left_on and right_on in mind. Okay, pandas merge was quite complex; the rest of the methods I’ll show you here will be much easier. Note: in the older version of pandas, there is a sort() function with a similar mechanism. But it has been replaced with sort_values() in newer versions, so learn sort_values() and not sort(). 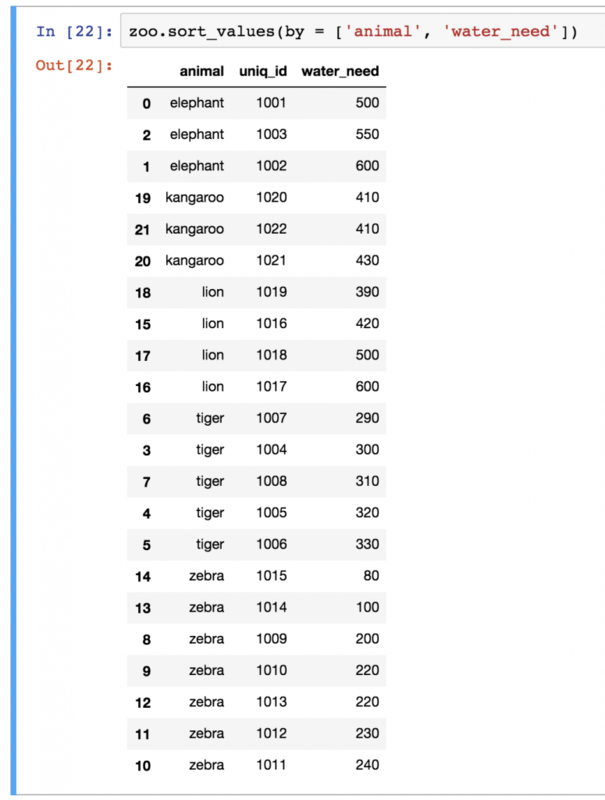 Note: you can use the by keyword with one column only, too, like zoo.sort_values(by = ['water_need']). What a mess with all the indexes after that last sorting, right? It’s not just that it’s ugly… wrong indexing can mess up your visualizations (more about that in my matplotlib tutorials) or even your machine learning models. 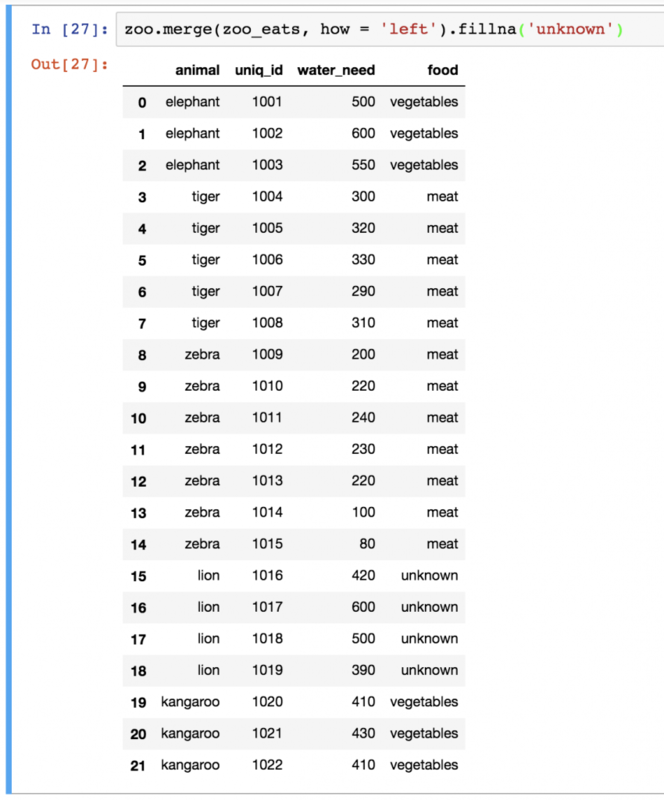 Note: since we know that lions eat meat, we could have written zoo.merge(zoo_eats, how = 'left').fillna('meat'), as well. Okay, you’ve gotten through the article! Great job! Here’s your final test task! The article_read dataset shows all the users who read an article on the blog, and the blog_buy dataset shows all the users who bought something on the very same blog between 2018-01-01 and 2018-01-07. TASK #1: What’s the average (mean) revenue between 2018-01-01 and 2018-01-07 from the users in the article_read dataframe? Note: for ease of understanding, I broke this down into “steps” – but you could also bring all these functions into one line. In step_1, I merged the two tables (article_read and blog_buy) based on the user_id columns. I kept all the readers from article_read, even if they didn’t buy anything, because 0s should be counted in to the average revenue value. And I removed everyone who bought something but wasn’t in the article_read dataset (that was fixed in the task). So all in all that led to a left join. In step_2, I removed all the unnecessary columns, and kept only amount. In step_3, I replaced NaN values with 0s. And eventually I did the .mean() calculation. And find the top 3 countries on the screenshot below. At step_1, I used the same merging method that I used in TASK #1. At step_2, I filled up all the NaN values with 0s. At step_3, I summarized the numerical values by countries. At step_4, I took away all columns but amount. And at step_5, I sorted the results in descending order, so I can see my top list! Finally, I printed the first 3 lines only. This was the third episode of my pandas tutorials where I showed you my favorite data formatting tools in pandas: merge, sort, reset_index and fillna. If you want to see more, take a look at this cool pandas cheat sheet . Thank for your helpful post. After read your examples, I think in this post, it not have lion and giraffe fields. Hope you have alot of helpfull posts.